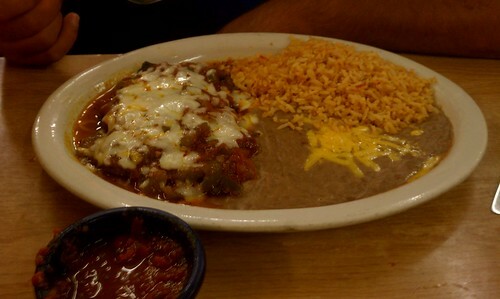 Los Mochis is a Mexican restaurant located in Sulphur Springs. 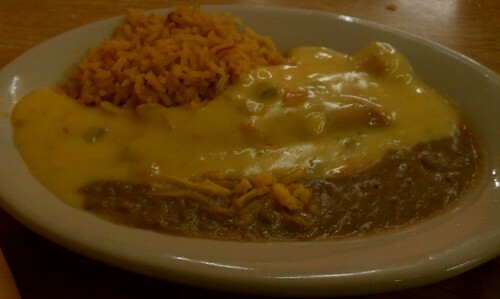 There aren’t too many restaurants that we haven’t tried in Sulphur Springs, except for a couple of Mexican restaurants. A lady at the Factory Outlet store actually suggested Los Mochis, so we decided we would give it a try. The restaurant is located in the strip mall just behind the Factory Outlet store and just off of I-35. The interior is a bright orange with various Mexican decor items on the walls on and the booth dividers. The restaurant is a pretty decent size for being located in a strip mall. Upon entering we were impressed with the service immediately. 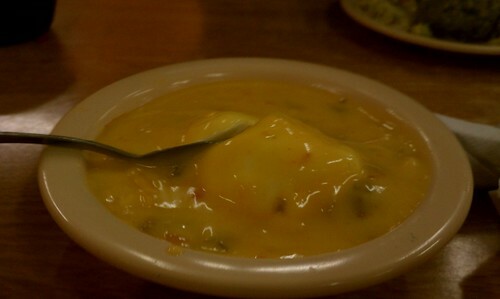 We ordered the Mochis Dip, which is queso with ground beef and sour cream mixed in. This was quite delicious, as were the chips. My husband ordered the Steak Ranchero, which was recommended by the host, and I ordered the Puffed Tacos with chicken. Our son had the kid’s cheese enchilada with rice and beans. Our overall feelings on the food was that, while good, we weren’t as impressed with it as we were everything else about the restaurant. The steak seemed to be somewhat low in quality and the chicken in the puffed tacos was a little on the dry side. Our son did enjoy is cheese enchilada though. The rice and beans were also excellent. The beans actually had some flavor to them. I believe that we will be back to Los Mochis to try some different menu items, but considering the Steak Ranchero was recommended, we’re not entirely sure that our experience would be much different. Los Mochis is located at 221 Industrial Drive E. #221 in Sulphur Springs, Texas.